Eight miles of hiking trails meander through the estuarine areas of Goose Creek State Park. The diversity of wetlands ranges from freshwater and brackish-water marshes to black gum and cypress swamps. Large stands of pine and mixed forest provide cover for a variety of birds and land animals. The trail loops through an upland forest and incorporates short stretches of boardwalk across wetlands. Point of Interest: The trail features a boardwalk that ends at Flatty Creek, affording views of both Goose Creek and the Pamlico River. Location: Runs from the campground at the mouth of Goose Creek to the Pamlico riverfront. Boardwalks pass through black gum and cypress swamps. The trail winds its way through patches of huckleberries and acts as a connecter-trail between Live Oak and Mallard Creek trails. The trail winds through the forest and provides peeks of Upper Goose Creek through trees along the way. The trail features a canopy of live oaks draped with Spanish moss. This loop-trail follows the shoreline of the Pamlico River for a short distance and then turns inland. 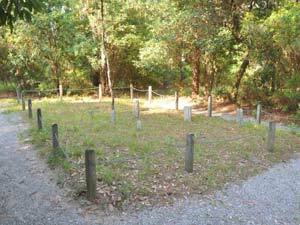 Point of Interest: The trail passes a historic cemetery dating from the 1880s.